Good day everyone. Thank you so very much for stopping by. For the first time ever, I was gobsmacked at the grocery store! Yes, it’s true. 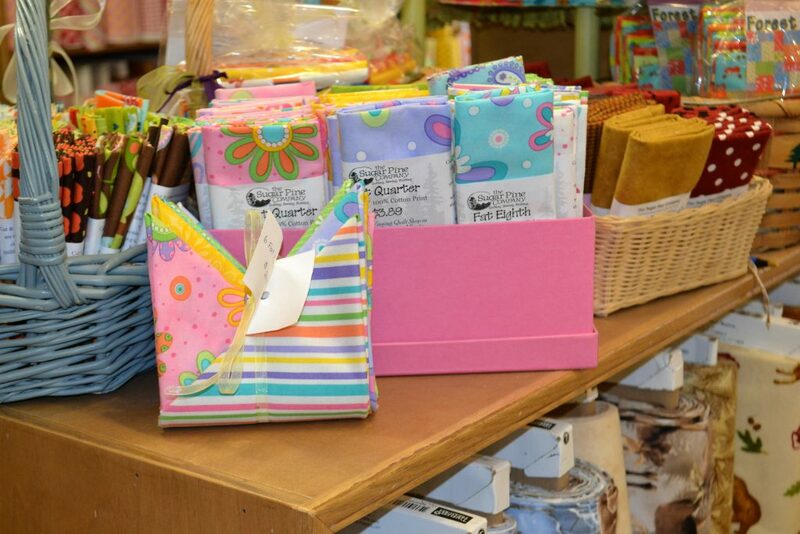 I was aimlessly walking the aisles at Co-op, sauntering here and there when I decided to stop in the “greeting card aisle” and have a peek at the latest quilt magazines…Quilting Arts, Easy Quilts and Modern Quilt magazine. 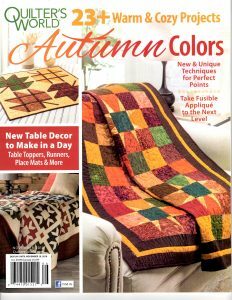 But, my eye was drawn to Quilter’s World magazine with the lovely autumn colours on the cover. It was so fall-ish! So warm and inviting. Standing there, my shopping cart filled with eggs and veggies and jujubes, flipping through the pages of the issue, I stopped with a jolt on page 57. 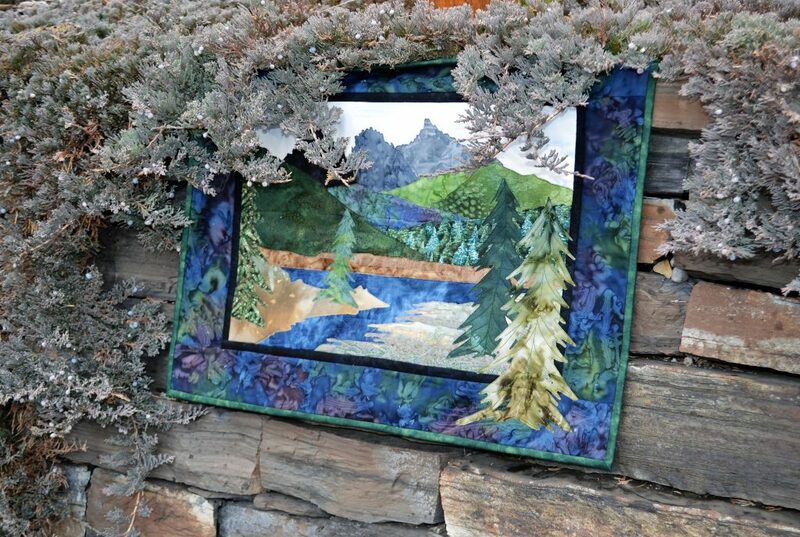 “Quilting in the Canadian Rockies” by Kim Hanson! What was this? My article? This was the first time ever I was surprised to see my own written words. But there they were in black and white. I had written the piece for Quilter’s World’s Winter 2017 issue. Unfortunately, they had run out of space for that issue and my article was “shelved”. That had never happened to me before, so I didn’t know what to expect. I was paid, but would my piece ever be published? I really didn’t know. several times to visit with quilters in the area, to photograph them and their quilts. 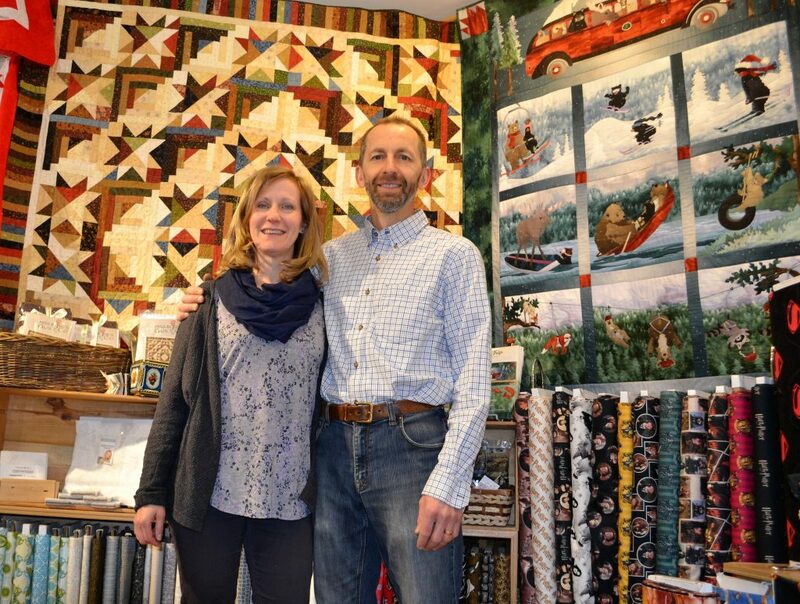 I met Leah and Dean Murphy, the owners of The Sugar Pine Company, a destination quilt shop nestled in the Canadian Rockies. 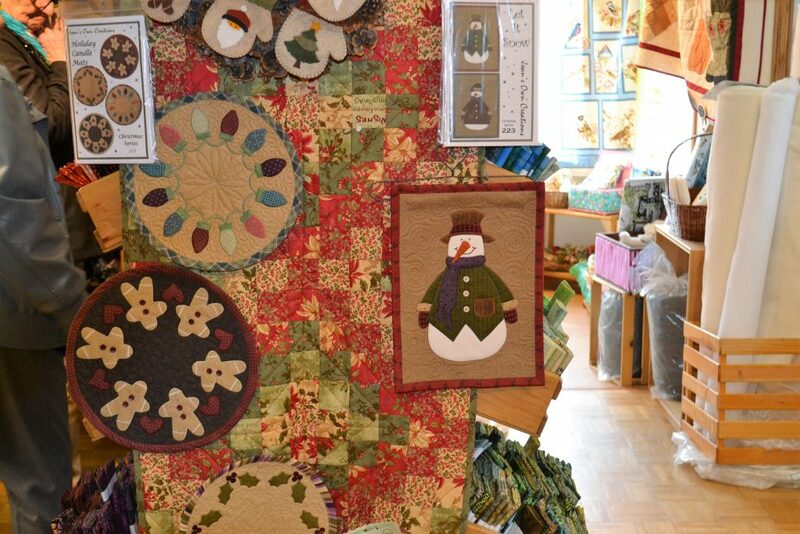 They were lovely and I got some great shots of both of them and their wonderful quilt shop. I met Jillian Roulet, an art quilter of distinction. Her quilts are unique, impressively creative and little jewels of art. 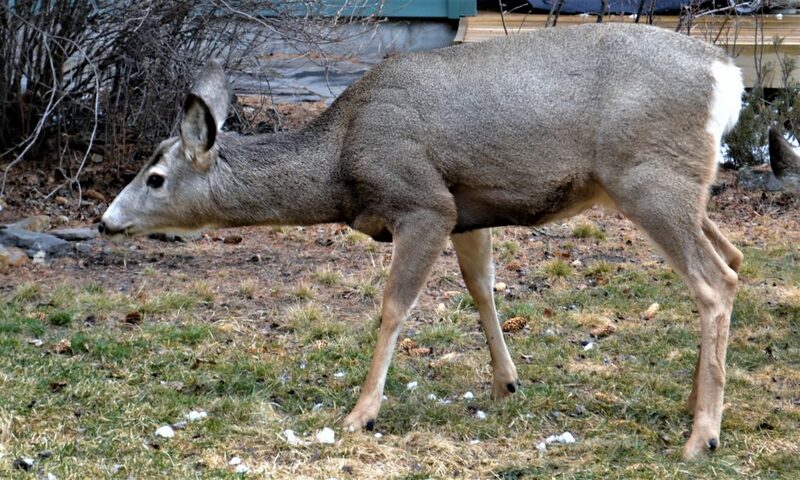 She lives a “mountain” lifestyle, in that she lives among the evergreens in the forest, the deer in the front yard and essentially creates every day. 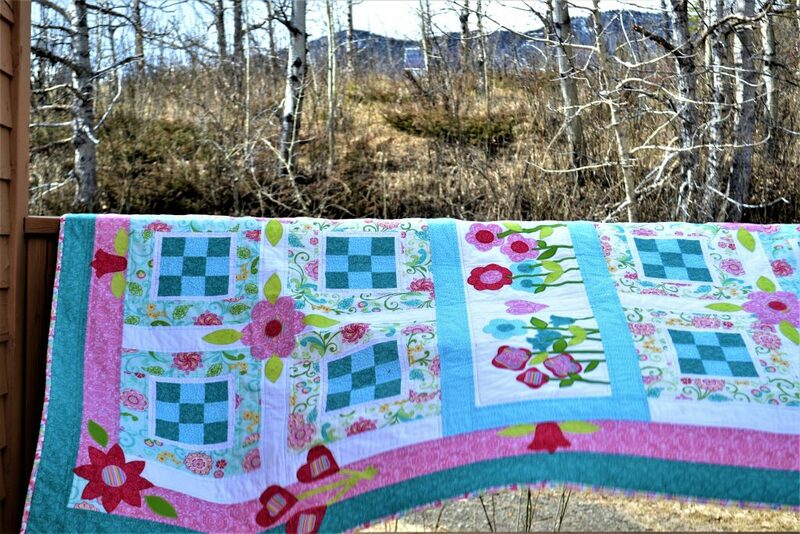 QW also published a photo of my quilt, which I call Carina. It had previously been featured on the cover of one of Annie’s Publications. I am extremely grateful to both Carolyn Vagts and Barb Sprunger at Quilter’s World magazine for their guidance, expertise and finesse. Thank you ladies! Welcome everyone. I’m pleased as punch to be back here again with all of you! 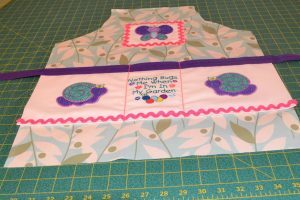 This time, we are making a summery, sweet and super-easy child’s gardening apron, embroidered with Designs by JuJu’s Bugalicious design set. They are just perfect for this project! 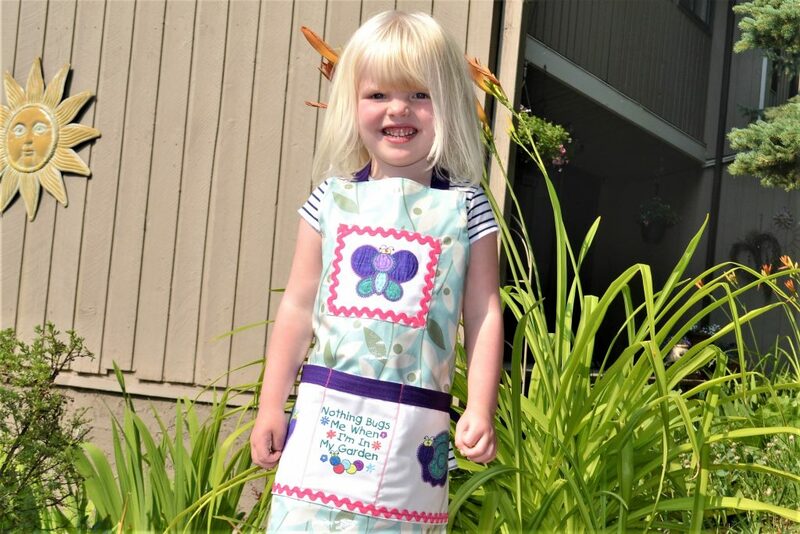 This apron is made using laminate for a clean and easy “wipe down” after use, and can be made over the weekend. Why not get started? Your five-year old will love it! 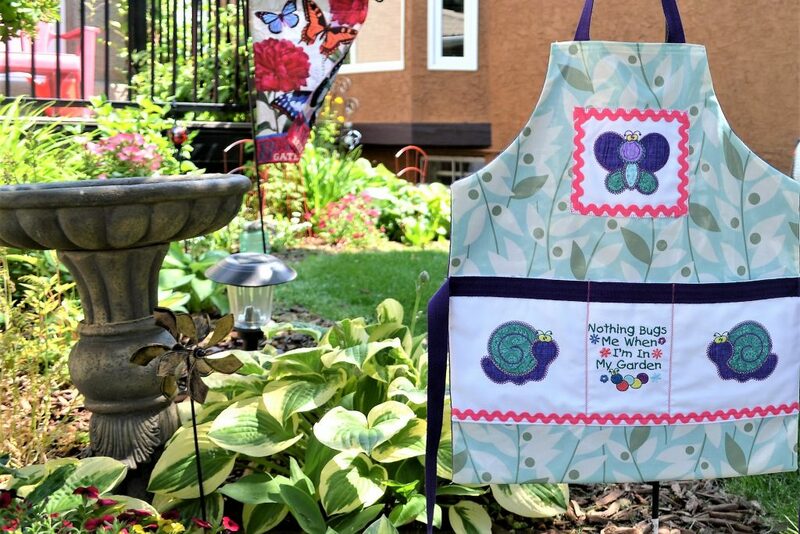 In case you and your child are finished gardening for the season, you can always use this sweet little apron for your child’s crafting endeavours. It would also make a great painting apron. Please be sure and read through all the instructions prior to commencing. (If you have never worked with laminate before, please note the special instructions at the end of the pattern). Download three Bugalicious designs (as per the photo of the apron front, or choose your own) all in the small, 4″x 4″ size. Beginning with the word/saying embroidery design, load it into the machine. 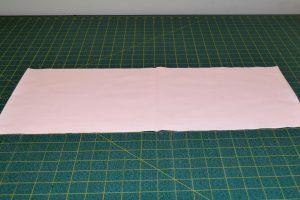 Fold 10″x44″ piece of white fabric in half to measure 10″x22″and press to mark the middle. Mark center with a pencil. Medium hoop white fabric and place the hoop onto the machine. Note: I didn’t use stabilizer for this project, but instead used a double fold of fabric to strengthen the front pouch/pocket even more. 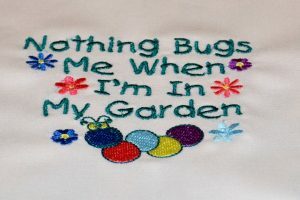 Stitch out the word/saying – Nothing Bugs Me When I’m in My Garden. Always clip jump threads as you go. Remove hoop from machine and fabric from hoop. Press. Fold in right outer edge to mark center and press. 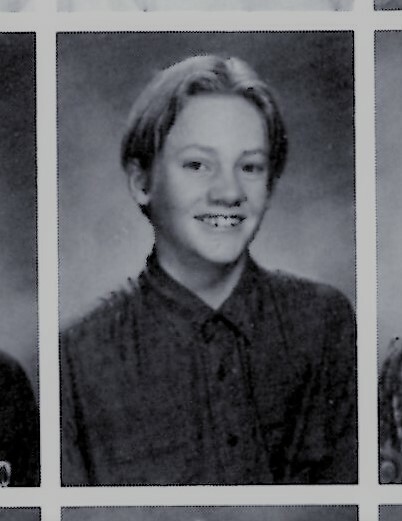 Mark with a pencil. Re-hoop fabric and stitch out first snail applique design. 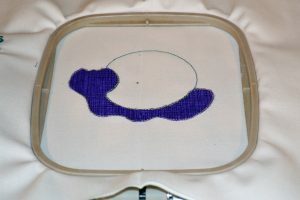 Place the hoop onto the machine and stitch out the embroidery design outline. Remove hoop from machine. Cut a fabric scrap slightly larger than the outline stitch. Spray starch the right side of fabric scrap and press. Spray the wrong side of fabric scrap with temporary spray adhesive. Center and finger press fabric onto the outline stitching. TIPS: Cover ironing board when using spray starch and fabric adhesive to prevent over spray. Temporary fabric adhesive often leaves behind a residue on the needle. It may be necessary to clean your embroidery machine needle as you go. 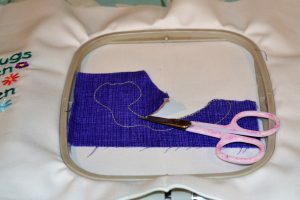 Replace the hoop onto the machine and embroider tacking stitches. 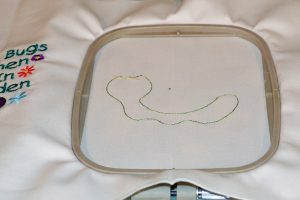 Remove hoop from the machine and carefully trim around the outline. Place hoop back onto machine and finish embroidering the rest of the design. Remove hoop from machine and fabric from hoop. Press. Fold in left outer edge and press to mark center. Mark with a pencil. 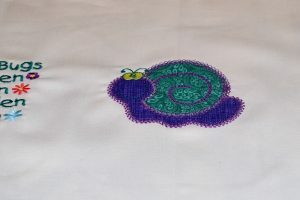 Re-hoop fabric and stitch out the mirror image of the snail applique design, following same steps as outlined above. 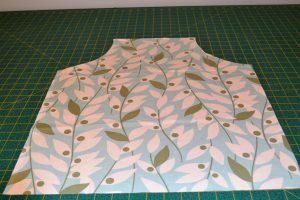 (See photo of apron for design placement) Trim pocket/pouch to measure 8″x18½”. Hoop both pieces of white fabric measuring 8″x10″. 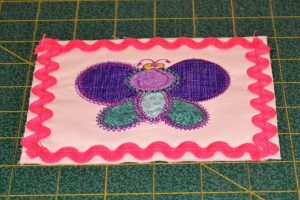 Stitch out butterfly (upper) embroidery design in the same manner as instructions outlined above. Press. 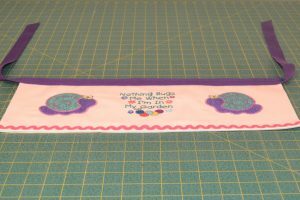 Trim butterfly block to measure 5½” (length) x 6″ (wide). Set aside. Right sides together match pocket/pouch with teal lining. Stitch bottom and top ¼” from edges. Leave sides open. Turn pocket/pouch right side out, and pull out the corners. Press. Stitch pink rickrack along bottom edge of pocket/pouch. Cut 48″ of purple strapping. Trim each end of strapping on the diagonal to prevent fraying. 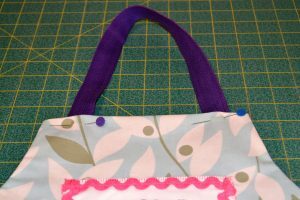 Center and pin purple strap to top of pocket/pouch. Stitch. Stitch rickrack in place around perimeter of butterfly design. Press laminate fat quarter on back of fabric. Do not press on the laminate front! Your iron will stick to the fabric and it will be ruined. 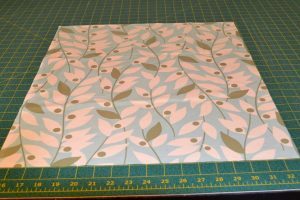 Lay out the fat quarter wrong side down on a flat surface. Fold over fat quarter in half lengthwise. Draw armholes on wrong side of laminate with permanent fabric marker. 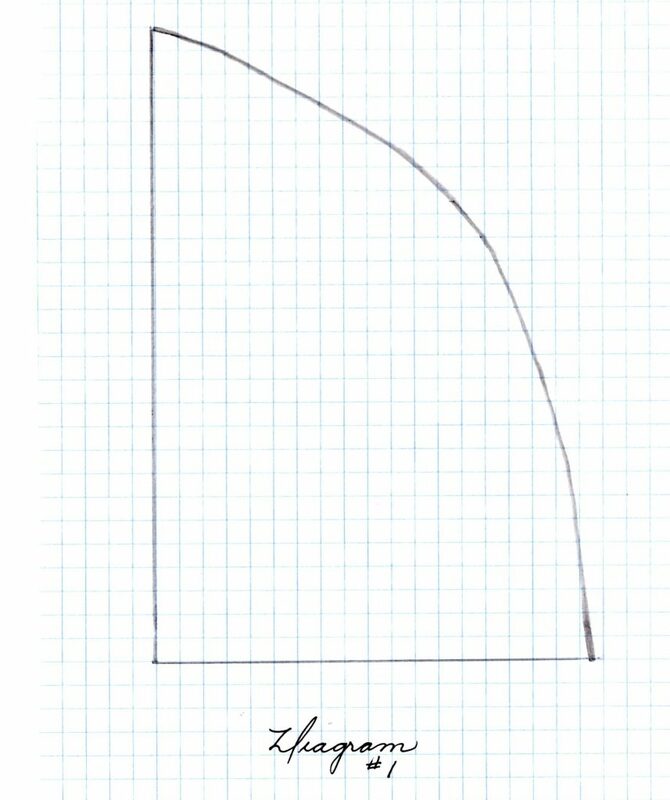 Trace using diagram #1. Cut purple apron lining in same shape as apron front. Set aside. Position butterfly embroidery applique design in place. Stitch. Mark a straight line with a pencil 3½” from bottom edge of apron front. Position pocket/pouch on the straight line and stitch along bottom edge only. Carefully trim pocket/pouch to even on both sides of the apron. Be mindful not to cut through the purple waist strapping. Mark pencil lines on pocket/pouch either side of the embroidered saying. 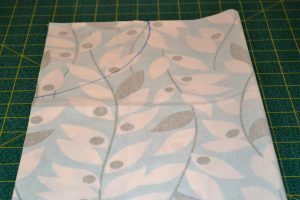 Stitch down both pencil lines to make three pockets. 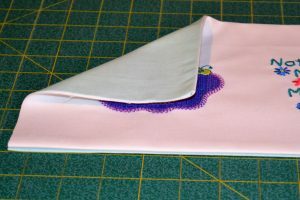 Fold in both ends of purple strapping and temporarily pin to the center of the apron top. Right sides together, match purple apron lining with apron top. Pin to secure. 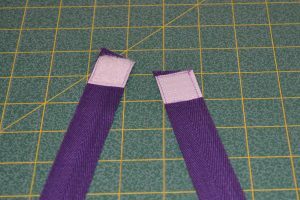 Mark both the top and bottom of purple strapping on both sides of the apron top with pins. 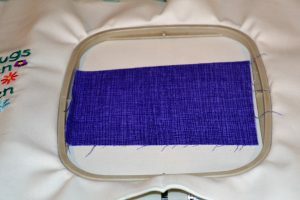 Stitch around perimeter of the apron leaving the top seam open and stopping at side pins to leave opening for purple strapping. Turn apron right side out being mindful to carefully pull out bottom apron corners. Remove pins holding purple straps in place. Fold in fabric edges around strapping on both sides of the apron top and stitch to secure. Insert neck strap into upper opening, fold under seams and pin as per photo. Stitch opening closed encasing the neck strap. *Optional – You can snip the neck strap in two and use Velcro to re-fasten or a D-ring as an adjustable option, for a tighter fit. Yippee! You are all done. Thanks so very much for following along with me on this pattern. Please email me at km.hanson@shaw.ca if you have any questions about the pattern. There is no need to prewash laminated fabric. The polymer film does not like either your washer or your dryer. 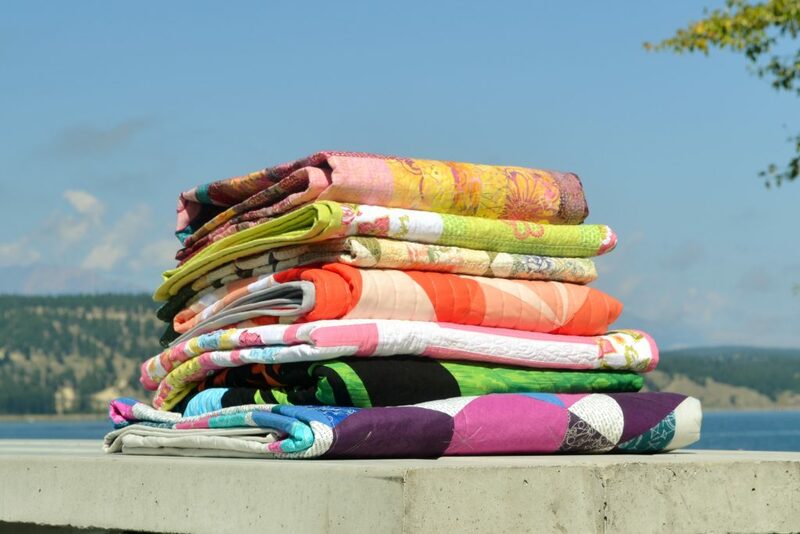 Iron laminates on the back of the fabric or use a pressing cloth when ironing laminates. Be careful not to touch your hot iron to the actual plastic surface of the fabric as it will melt. Stitch slowly and deliberately. If a seam has to be ripped out, the stitching holes themselves will remain in the fabric. Use pins mindfully. Once the pin leaves a hole in the laminate it will remain there. 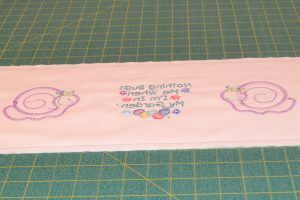 Although laminates are a more rigid and inflexible type of fabric than are regular cottons, it is still advisable to use a stabilizer when embroidering directly on the fabric. Hello everyone! Thank you so very much for all your lovely, compassionate and thoughtful emails and comments. It never ceases to amaze me how wonderful and caring people really are. One of my designs did get chosen for Annie’s upcoming special interest publication. I wasn’t really sure how I’d react to having a project set before me, but I found out, oddly enough that I really do love to quilt! I thought quilting for me had come to an end. I had been contemplating selling off my sizable stash and concentrating entirely on my writing. But due to Mikes’ passing, I’m beginning to discover what is really important to me and quilting is, after all. My hopes and dreams are that I can combine my quilting and writing – which is what I’ve wanted to do all along. I’ve written two children’s picture books (for ages 4 to 8) that do combine quilting and writing. I’m patiently waiting for that “needle in a haystack” publisher that will take on my stories. Fingers crossed! I’ve also discovered, thanks to my son, that I need to drop all the “shoulds” from my life. How many times in the past did I consider what I “should” do instead of what I really wanted to do? Public perception, social pressures and old ideas that have been drilled into my head are going by the wayside. Mike’s untimely death has made me realize some very important things. Time is limited and it may very well end abruptly. No more trying to please everyone with the decisions I make. No more wondering if someone will not like me if I turn them down. No more anxiety over which direction to go. I will step back and really assess my decisions, using updated criteria. I’ve learned that life can easily take us on tangents, in directions we have no business travelling. 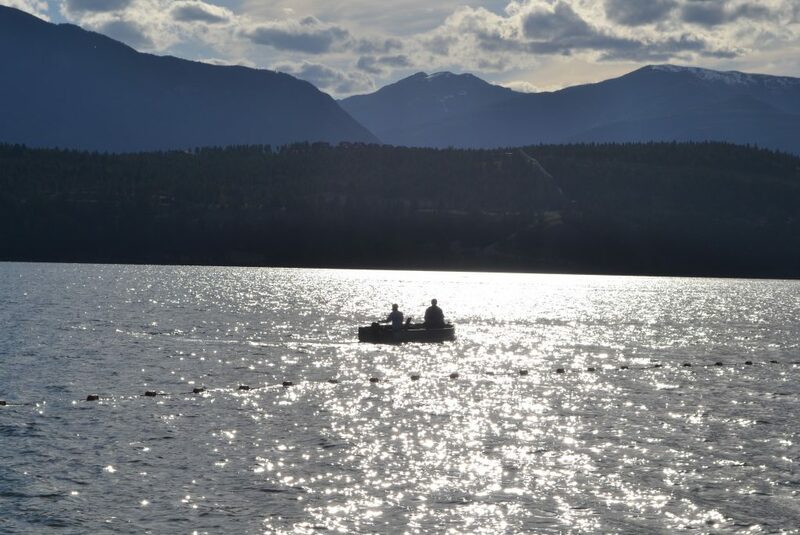 I want to spend as much time as possible at the lake in B.C. It’s peaceful and quiet and relaxing from morning ’till night. On one of our trips home from the lake, something incredible happened to Rick and I. 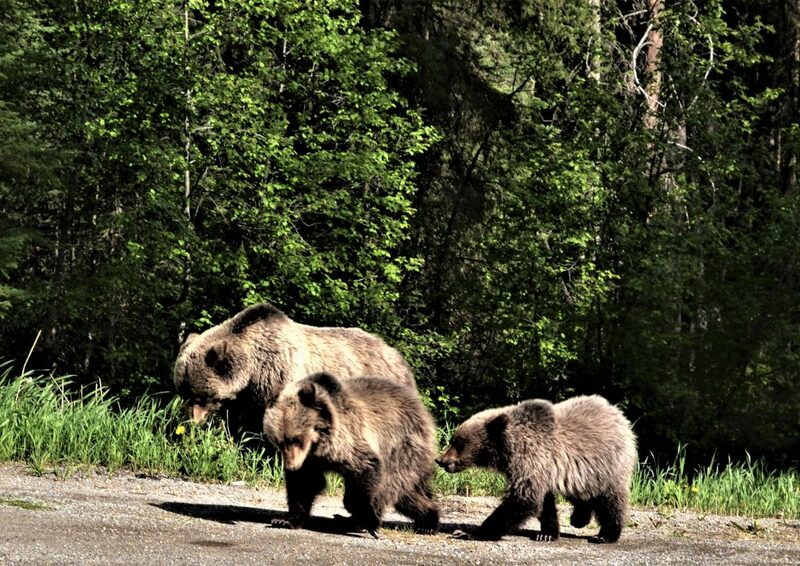 As we were driving past Radium and up to Olive Lake, on the side of the road (highway 93) we came upon a mother grizzly bear and her two cubs. There was no one else on the highway, just us. We were able to stop so near the bears and watch them. 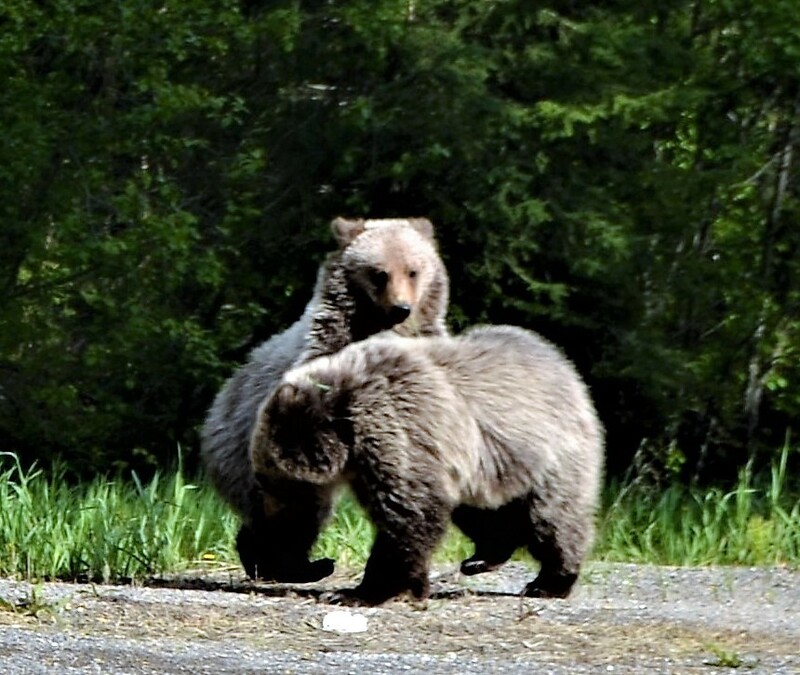 The cubs began to frolic with each other, play fighting, while mom paid no heed to us or her cubs. It was a special, incredible moment. You know, if that wasn’t enough of a gift travelling home, we were about to receive another. 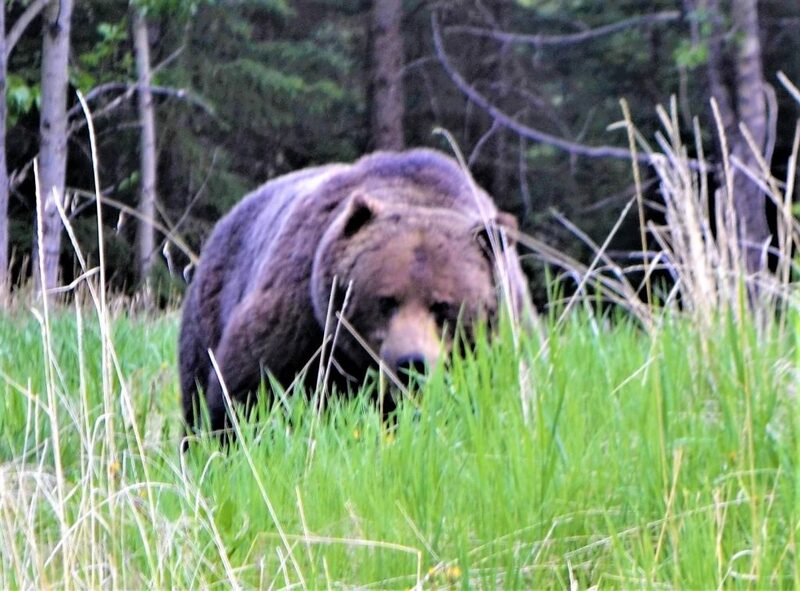 I jokingly said to Rick, “Ok, since it must be our lucky day, let’s go find Bear 122!” For those of you unfamiliar with this beast, he’s an infamous male grizzly who, at times, has terrorized the Bow Valley Parkway / Castle Mountain junction with his antics of eating a black bear and fathering almost all of the bear cubs in the area. He’s quite the brute and quite the character! 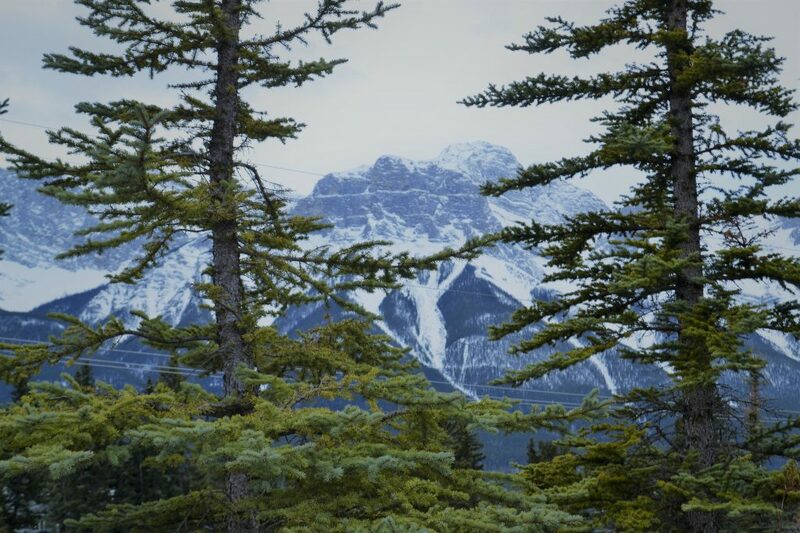 Rick took me at my word and instead of turning onto the TransCanada highway off of highway 93, we went straight through and travelled the Bow Valley parkway, craning our necks the whole time looking for the big fella. Of course, the whole search was a wildcard, like searching for a “needle in a haystack”. We got to the intersection leading back onto the TransCanada and lo and behold, there he was! I was speechless! Who the heck goes on a bear hunt and actually finds the guy you’re looking for? No one, that’s who. It was crazy. 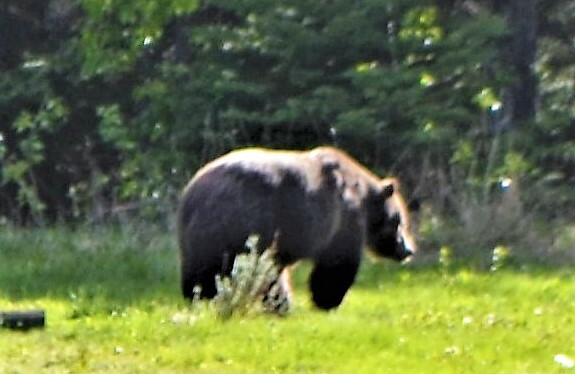 I got some photos of him as he walked in front of our vehicle and into the adjacent field to eat, eat, eat, which I suspect is all he does most days. We knew it was Bear 122, because he had a cut on his face, apparently caused by an errant porcupine quill. He was basically on the move the whole time, so my photos are okay, but not great. He was gigantic! Clearly the master of his domain. The sighting of Bear 122 was one of those rare moments neither my husband nor I will ever forget. Thanks so much everyone. Hope your summer is going great. Last year, I had occasion to interview a lovely lady, a talented art quilter who lives nearby. The interview was for American Quilter Magazine – my article entitled, Is Quilting Healing Medicine? Margaret Jones Jessop had lost her beautiful 31 year old daughter, Katy, in 2014. At the time, I couldn’t relate to Margaret and her family’s searing, lingering pain. Now, unfortunately, I can. It’s one club that I wish I didn’t belong to – parents who have lost a child. Margaret mentioned to me that she didn’t touch her sewing machine for six months after Katy’s death. She had no interest whatsoever in sewing or quilting or creating. I get it, completely – I haven’t touched my sewing machine since Mike’s passing. It’s like all creative juices instantly dry-up. There is a deep feeling of “what’s the point”? Three weeks ago, my husband casually mentioned to me, “Maybe we should get that dog now”. I know that it was his attempt to make me feel better and I love him for that. I had been searching online for a older, rescue dog…a hypo-allergenic senior that wouldn’t irritate my allergies and was already house trained. I had been monitoring several Alberta senior dog rescue websites like, ARTS, Senior Animal Rescue, Misty Creek Dog Rescue, and of course, the City of Calgary. but finding a small, senior dog in a certain breed (shih tzu, bichon, maltese) is like trying to find a needle in a haystack. Then I happened upon Heaven Can Wait, a rescue organization run by Kim Hessel from a rural setting outside of High River, Alberta. I was inquiring about Beau the Bichon but Kim regretfully let me know that Beau had already been adopted. 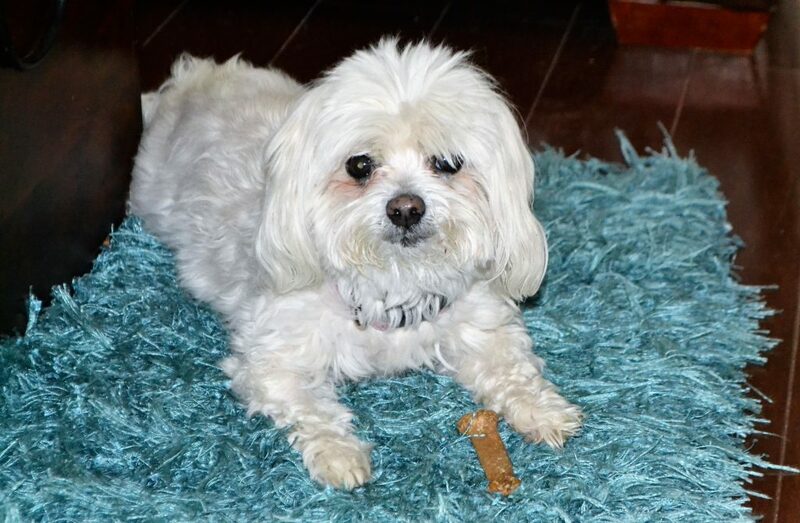 But, as luck would have it, she had a ten-year old, ten pound Maltese rescue that would be available for adoption. “Snowy” as her previous owner named her, was used to peace and quiet and needed to be placed in a home without children living there and be the only dog in the home. That was us! Placing a senior dog with seniors? Hmm…it sounded like a good idea to me. 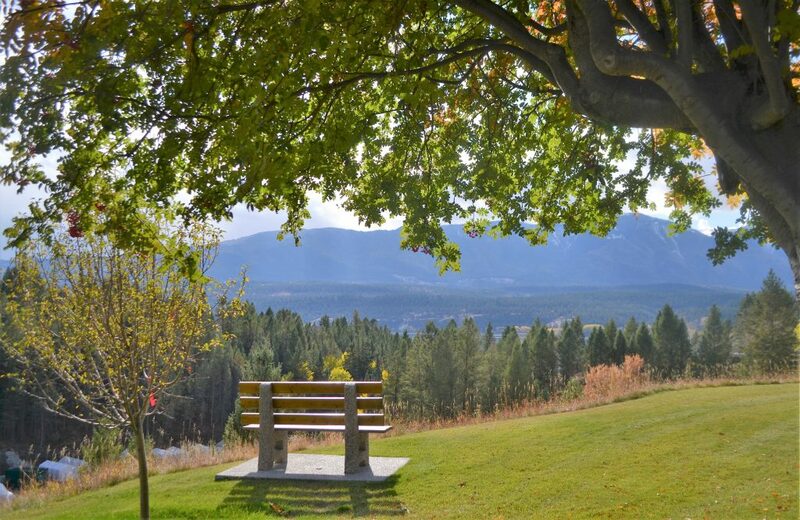 So, Rick and I took a road trip and headed out to High River to meet the dog. She was adorable! It was love at first sight for me. It took Rick a smidge longer. After some extensive doggie dental work, Kim gave us the green light and we took Snowy into our home for a ten-day trial period, which passed in the blink of an eye. Snowy is absolutely lovely and now she’s our little dog. We take her on daily walks, car rides and she sleeps on our bed at night. 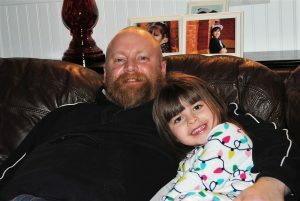 She’s eased the pain, just a little bit, of losing our beloved Mike. It’s like she fills a portion of that gaping void in your heart. She’s like a tonic that soothes. She’s an affectionate little girl that brightens our day. She’s wonderful company. The other day, just out of the blue, I decided to work on some quilt designs in response to a “call for queries” from Annie’s Publishing. 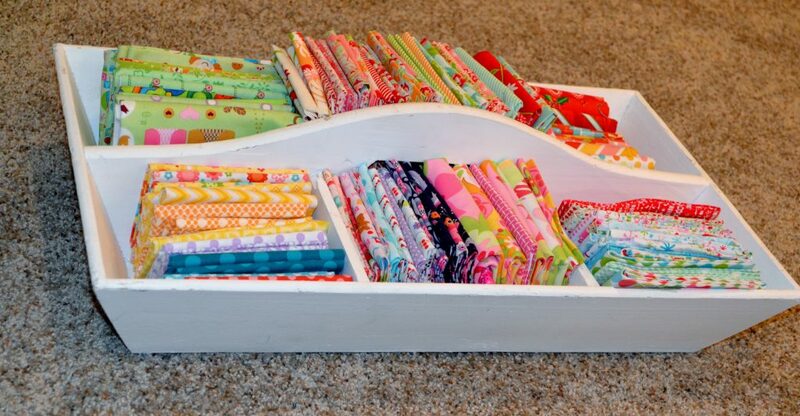 Like I used to do, before Mike passed, I started to pull out fabrics from my cupboard. I sat down at my desk and drew and erased and drew some more. It was so cathartic! I couldn’t believe how being creative was part of who I am. I came up with three queries for the editors and we’ll see if they like them or not. But, the funny thing is, it doesn’t really matter if they choose my designs or not. What matters is that I actually “felt” like doing my work again. I actually “felt” like choosing fabric palettes. I actually “felt” like myself again. It was temporarily, exhilirating. I know this new development is not just because of a dog. Rick and I both have a very long way to go. But I also know that Snowy has helped us tremendously. I hope we can make a good home for her and give her some happy years. Just like she will give us. How DO you mend a broken heart? A crushed soul? A devastated mind? I’m not sure and I sincerely wish I didn’t have to find out. Our beautiful son, Mike, passed away from this world into God’s loving arms on March 15th…leaving us all in shock, disbelief and tremendous sorrow. My husband and I knew, due to Mike’s health circumstances, that he would not outlive us – but we never saw his death as imminent. Mike was diagnosed with schizophrenia in late adolescence. Back in those days, (1996 ish) we knew our boy’s behaviour was, at times, “out there”, but we really didn’t know what we were dealing with. Countless physicians and psychiatrists and psychologists appointments later (and I really mean countless), Mike was finally diagnosed with the severe mental illness of schizophrenia. Initially, there was overwhelming relief at finally knowing what was plaguing our troubled teenaged boy. We were blessed to have our son for 38 years. We are missing him so profoundly that it’s difficult to really take it all in. A month and a half after his passing, I’m still in disbelief that he is gone…that he will never again set foot in our home, that he will never again sit in his chair for Sunday dinner, that he will never again phone me to talk after a Blue Jays baseball game. I will never again see his smiling face and waving hand when meeting him at his favourite restaurant (Swiss Chalet) for lunch, or at the theatre for a movie or at Co-Op to pick-up some groceries. That, is the true heartbreak. I am a spiritual person and always have been. We know that our sweet and gentle Mike is resting in peace, that his pain has been retired and his struggle has mercifully ended. We also know that our souls will mesh again with his when we leave this life. What we don’t know is how to truly live life now that he’s gone.